Now released for forward thinking coaches! NEW BOOK – Coaching the 4-2-3-1 shows you why the formation is becoming one of the most dominant styles of play in modern soccer. Now you can discover how to train your players to utilize this highly flexible and attacking formation in Coaching the 4-2-3-1. Packed with soccer drills, diagrams on setting up your team and guidance on the formation’s philosophy and playing mindset, this book provides you with everything you need to know about playing the 4-2-3-1. Is your team stuck playing a predictable, rigid style of soccer your opponent’s find easy to counter? Do you yearn to play an expansive attacking style of soccer, like Real Madrid, Manchester United or Brazil? The 4-2-3-1 is an innovative and highly flexible formation used by many elite teams over the last decade to devastating effect. Whether you coach players in top divisions or recreational sides, playing the 4-2-3-1 can enable you to adopt a more dynamic and creative style of soccer that can take your team to the next level. Coaching the 4-2-3-1 is a book focused on developing both your team’s understanding of how to play this fast paced formation effectively. Soccer is a game that is constantly changing, with new formations and philosophies evolving to challenge the status quo. The 4-2-3-1 is a formation that is now used by many of the world’s elite coaches, like Jose Mourinho, Arsene Wenger and Sir Alex Ferguson, to counter the 4-4-2 and other more static formations. Coaching the 4-2-3-1 shows you how coaches at the top level implement the formation, both in defense and attack. Packed with more than 30 training sessions and 150 diagrams, this book will show you how to train your team to play the ball wide, how to look for overlaps, when to penetrate the forward line and all the other aspects of playing this highly flexible formation successfully. “This book will be of great interest to coaches worldwide and has taken an interesting look at one formation in the modern game. Stevie has looked at the top managers and how they have developed this system for their own team and he has added really useful coaching practices which would allow anybody to try and implement this system with their own players. I particularly like the use of video capture of recent games to illustrate the key points and will bring the book alive for all readers.” – Neil Mackintosh, Performance Manager – Scottish F.A. The 4-2-3-1 first started to appear on soccer pitches just before the Euro 2000. Under Arsene Wenger’s stewardship, Arsenal had used it to march to dominate the English Premier League and to pass rings around teams playing the more rigid 4-4-2. In Arsenal’s formation, Denis Bergkamp would drop deep behind the lone striker while the wingers would provide support higher up the pitch, with two anchoring midfielders providing another line of defense. This dynamic style of play proved to be a revelation, with many other coaches eager to adopt it for their own sides. The 4-2-3-1 was used by the French national side to successfully win the Euro 2000 tournament, with a strong triangular midfield where there was always a spare man to pass to. Their success led to many elite coaches adopting the formation, including Jose Mourinho at Real Madrid and Sir Alex Ferguson at Manchester United. The formation also took center stage at Euro 2012, with it being used by three of the tournament’s semi-finalists: Spain, Germany and Portugal. The reason so many coaches have switched from 4-4-2 and 4-3-3 to the 4-2-3-1 is because it is far more flexible and can enable teams to quickly change formation to both confuse and counter opponents. Wingers, for example, can drop deep to create a 4-4-1-1 or move forwards to create a 4-3-3. This range of options makes it very difficult to defend against as opposition coaches never know what you’re going to do. Coaching the 4-2-3-1 shows you how to train your team in all of the key principles of playing this creative formation. It will both enrich your coaching knowledge and train your players to use this dynamic and highly creative formation to exploit the rigid playing style of teams living in the past. 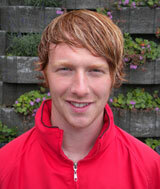 Stevie has been coaching since 2003 when he started at the age of 16. 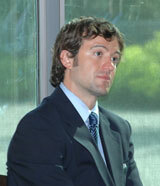 Stevie started out developing technical footballers – which is always his primary focus – but as he has grown as a coach, he has taken more of an interest in tactical development and future evolution of football, analyzing various teams and looking to find unique parts of their play and expose it to the footballing community. Since 2003, he has coached with a number of clubs in Soccer, both grassroots and professional, with players of all ages and abilities, including Dundee FC, East Fife FC, Raith Rovers FC, FC Gland, United Soccer Academy and Head of Youth Development and 1st team Head Coach for Garhwal FC. 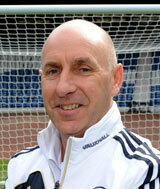 Stevie also coached youth players with prominent Scottish Futsal Club; Perth Youth Futsal, until 2012 – a club who have competed in the UEFA Futsal Cup Prelinamary round on several occassions. He likes to push himself to the next level and has considerable experience in working in different environments; Stevie has worked full time in 4 countries on 3 continents; Scotland, Switzerland, USA and now currently, India, where he works at the Technical Director for Garhwal FC of the Indian I-League 2, and as Head of Coach Education for Bhaichung Bhutia Football Schools, where he leads a team of over 80 coaches and over 1100 players. 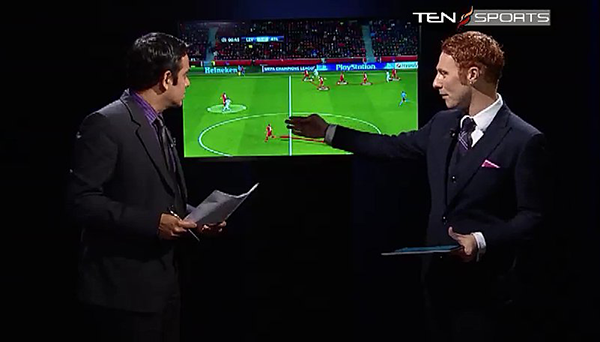 Stevie’s tactical analysis work has led him to being asked to be a TV Pundit for Ten Sports, as a tactical analyst for Champions League Matches, and is also an established author, having written 10 books by the age of 26, with a specialization in coaching the 4-2-3-1, of which he has written 3 books Here, here and here. Stevie is qualified to level 5 in Childrens’ Coaching via the Scottish FA, level 4 in youths coaching, has a FIFA Futsal Diploma and is currently studying to obtain his UEFA B Licence in 2015. Coaching the 4-2-3-1 opens with a guide on how elite coaches, like Vincent Del Bosque and Jose Mourinho, utilize the formation. It then provides a series of chapters packed with soccer drills to coach your players in the mindset and positional awareness needed to play the dynamic and fluid 4-2-3-1 formation effectively. The book’s first chapter focuses on developing the tactical mindset to play 4-2-3-1 effectively. This includes how to build passing combinations, how to use triangulation to create space and how to develop support play in the final attacking third. Smooth, accurate passing is vital when playing the 4-2-3-1. This chapter provides two training sessions for small groups to improve their passing accuracy and first touch. In addition, you will find guidance on how to create movement angles, fluid passing and moving and possession games to develop a ‘keep the ball’ mentality. All the sessions in this chapter can be developed through building transitions and goal scoring scenarios. The rise to dominance of the 4-2-3-1 was demonstrated when Real Madrid played Barcelona on their home turf at the Nou Camp stadium, April 2012. A win for either side could be decisive in determining who won the league, so the stakes for both league success and pride were high. Grieve analyses how Real Madrid’s use of the 4-2-3-1 enabled them to stop Barcelona from breaking them down and enabled Real to emerge victorious in this epic encounter. The book now returns to focus on coaching with a chapter packed with 15 positional diagrams and 8 progressive training sessions for building cohesion between the defense as individuals and as a group. This includes how to prevent crosses, how to block passes and how to transition into attack once the ball is won back. The diagrams are designed to be used before training sessions as they show the positions players should be in when a goal kick is taken, when the opposition full backs have the ball and where they should be generally when defending. The chapter includes diagrams for playing against a 4-4-2, 4-3-3, 4-5-1, 3-5-2 and 4-2-3-1. The 4-2-3-1 creates four lines of players across the field. So there are always passing options, all the way from the goalkeeper to attack. In most formations there can be a tendency to ‘dump it in the channel for the striker to chase’. In the 4-2-3-1, however, long balls are replaced with smooth accurate passing. This chapter shows you how to build from the goalkeeper through the midfield and all the way to the front attacking line, using short passes and finding players in space. From working through the drills and exercises, your players will develop an understanding of how to find the right positions, when to move and where to make runs to receive the ball. The final chapter features 14 sessions that focus on the important aspects of attacking when playing the 4-2-3-1. The chapter also looks at ways of building better attacking units, with dual themed sessions such as using penetration to enhance counter attacking play. The 4-2-3-1 provides arguably more attacking options than any other formation. Grieve shows you how to harness these options and to train your players to be more dynamic and fluid around the box and to swamp opposition defenses. The 4-2-3-1 is a highly flexible, dynamic and creative formation. The ability to evolve and shape your formation to exploit the opposition’s weaknesses, whether they play 4-4-2, 4-3-3 or 4-5-1, makes it a very powerful system of play. Coaching the 4-2-3-1 shows you how to develop the mindset and the situational awareness to use it effectively to exploit opposing more static formations. A deeper understanding of the 4-2-3-1: how elite coaches play it, its playing mindset and how to harness it to beat other formations. The 4-2-3-1 is fast replacing the 4-4-2 and the 4-3-3 as the formation of choice for many of today’s elite coaches. However, even if you coach recreational or youth teams, the 4-2-3-1 can be a powerful and exciting formation to play at any level. Coaching the 4-2-3-1 provides you with everything you need to know about how to play the formation effectively and to create a more fluid, flexible and dynamic team. “Stevie Grieve should be congratulated on a great book. This book is extremely topical as the 4-2-3-1 is one of the most popular formations of the strongest teams in Europe these days. The book does a great job explaining the formation, how to implement it and how to coach it to your players.” – Jorge Diaz-Cidoncha, PhD of Sports Science and academy coach at San Agustin and San Martin in Madrid. Arsene Wenger was one of the early pioneers of the 4-2-3-1 in the English Premier League with Arsenal playing with variations of the 4-2-3-1 over a decade ago. Now Alex Ferguson has started making the transition with Manchester United from his beloved 4-4-2 formation to the more flexible 4-2-3-1 in order to compete with teams like Man City, Barcelona Real Madrid who all play with a 4-2-3-1. This eBook covers in detail how both Wenger and Ferguson have adopted the 4-2-3-1 for their respective teams, Arsenal and Manchester United. 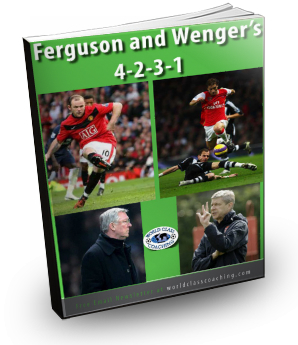 With 45 pages packed full of diagrams and video capture stills, this eBook does a great job of analyzing and breaking down how Wenger and Ferguson each use the 4-2-3-1 differently and will give you lots of ideas for implementing these tactics with your own team. And it’s free with your order of Coaching the 4-2-3-1. Few games evolve as fast as soccer. The 4-4-2 and 4-3-3 are now being replaced with the 4-2-3-1 by coaches at every level. Its enhanced flexibility, with a triangular midfield and attacking wingbacks, makes it an exciting formation, both for players and spectators. The ability to rapidly transition into a conventional 4-3-3 can also leave opponent’s standing still, not knowing which players to mark or which zones to cover. It’s no coincidence that three of the semifinalists at the Euro 2012 tournament all used 4-2-3-1. Those teams that didn’t are now rushing to catch up. If you want to be one of the coaches harnessing the 4-2-3-1 to dominate teams then Coaching the 4-2-3-1 provides you with everything you need to know. Packed with training exercises focused on the formation’s aspects along with guidance on the tactics needed to play it effectively, Coaching the 4-2-3-1 can show you how to harness the formation’s dynamism to dominate possession and create more goal scoring opportunities through a more expansive, fluid style of soccer. P.S. 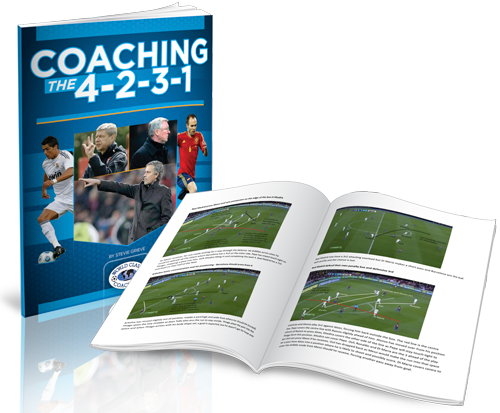 Coaching the 4-2-3-1 provides a complete guide to one of the most dynamic and successful formations in modern soccer. Along with a guide to its mindset and how it is used by many of today’s elite coaches, Coaching the 4-2-3-1 is packed with training drills, diagrams and explanations on how to train your players to harness this highly flexible formation to dominate teams with a dated and rigid playing style. 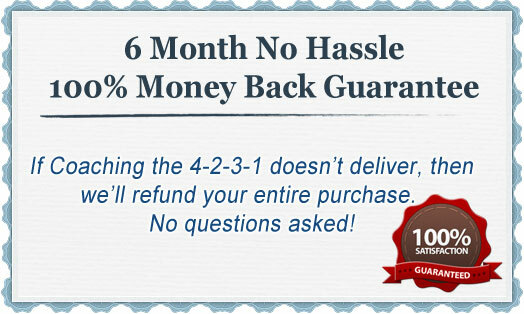 P.P.S If you are not 100% satisfied with the quality of the soccer coaching resources in Coaching the 4-2-3-1 after six months then we will refund your purchase in full, no questions asked.